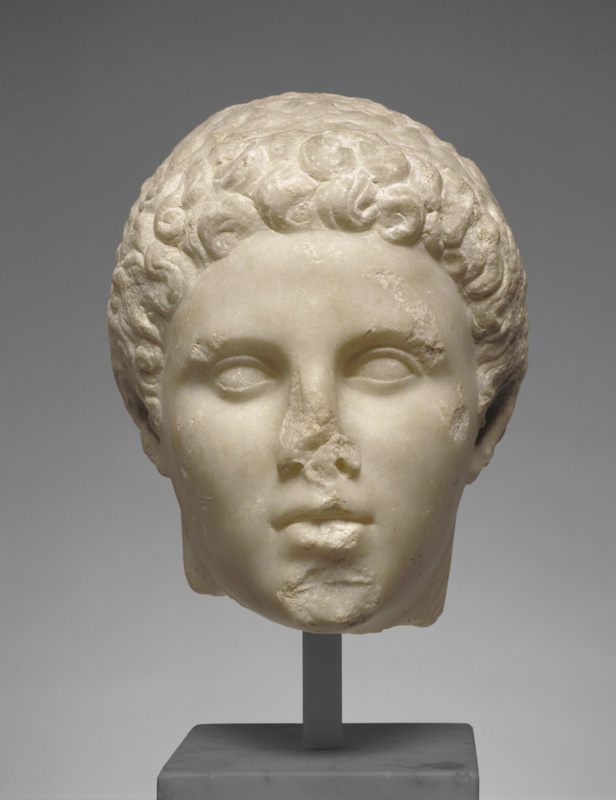 The son of a noble Macedonian family, Hephaistion was the beloved companion of Alexander the Great. Together since boyhood, Hephaistion fought alongside Alexander as he created his great empire. When Hephaistion died in Persia in 324 B.C., Alexander mourned him extravagantly. He was given a royal funeral and Alexander ordered the cities of Greece to worship Hephaistion as a hero. This head of Hephaistion, broken from a full-length statue, was originally part of a multi-figured group, which might have depicted a sacrificial scene. The J. Paul Getty Museum has more than thirty fragments of this group. The participants include Alexander, Hephaistion, a goddess, Herakles, a flute player, and several other figures, as well as animals and birds. This group may have served as a funerary monument for some nobleman who wanted to associate himself with Alexander, or it might be a monument erected in response to Alexander's call for the creation of a hero cult. Lipsius, Frank. Alexander the Great (London: Weidenfeld & Nicolson, 1974), p. 84. Fredericksen, Burton B., ed. The J. Paul Getty Museum: Greek and Roman Antiquities, Western European Paintings, French Decorative Arts of the Eighteenth Century (Malibu: J. Paul Getty Museum, 1975), p. 27. Guidebook: The J. Paul Getty Museum. Rev. ed. (Malibu: J. Paul Getty Museum, 1976), p. 47. Fredericksen, Burton B., Jiří Frel, and Gillian Wilson. Guidebook: The J. Paul Getty Museum. 4th ed. Sandra Morgan, ed. (Malibu: J. Paul Getty Museum, 1978), p. 29. Frel, Jiří. Antiquities in the J. Paul Getty Museum: A Checklist; Sculpture I: Greek Originals (Malibu: J. Paul Getty Museum, 1979), p. 7, no. 21. The Search for Alexander. An Exhibition. National Gallery of Art, Washington, D.C., Nov. 16, 1980-April 5, 1981; Art Institute of Chicago, May 14-September 7, 1981; Museum of Fine Arts, Boston, October 23, 1981-January 10, 1982; Fine Arts Museums of San Francisco: M. H. de Young Memorial Museum, February 19-May 16, 1982. New York Graphics Society: 1980, color pl. 2, top; pp. 104-5, no. 13. Vermeule, Cornelius C. Greek Art: Socrates to Sulla; From the Peloponnesian Wars to the Rise of Julius Caesar. Art of Antiquity 2, pt. 2 (Boston: Dept. of Classical Art, Museum of Fine Art, 1980), pp. 55, 59, 126, no. 71 B, ill.
Frel, Jiří. Greek Portraits in the J. Paul Getty Museum (Malibu: J. Paul Getty Museum, 1981), pp. 68-69, 112, no. 20. Vermeule, Cornelius C. Greek and Roman Sculpture in America (Berkeley and London: University of California Press, 1981), p. 133, no. 102. Stewart, Andrew. Review of "The Search for Alexander." The Art Bulletin 64, no. 2 (June 1982), pp. 321-26, p. 324. Mentioned. Frel, Jiří. "Ancient Repairs to Classical Sculpture at Malibu." The J. Paul Getty Museum Journal 12 (1984), p. 81, no. 23. Giuliani, Luca. Bildnis und Botschaft: Hermeneutische Untersuchungen zur Bildniskunst der römischen Republik (Frankfurt: Suhrkamp, 1986), pl. 35; p. 153 ff. Smith, R. R. R. Hellenistic Royal Portraits (Oxford: Clarendon Press, 1988), p. 158, cat. no. 16; pl. 12, 5. Stewart, Andrew. Greek Sculpture: An Exploration (New Haven, CT: Yale University Press, 1990), pp. 191-92, fig. 577, ill.
Vallera-Rickerson, I., and M. Korma. "Merika ellenika ekthemata tou Mouseiou Getty." Archaiologia 43 (1992), p. 85, fig. 7. Stewart, Andrew. Faces of Power: Alexander's Image and Hellenistic Politics (Berkeley: University of California Press, 1993), appendix 5, "The Getty Fragments: A Catalogue," pp. 438-52, pp. 439-40, no. 2; figs. 150-154. Bergmann, Marianne. Die Strahlen der Herrscher: Theomorphes Herrschrbild und politische Symbolik im Hellenismus und in der roemischen Kaiserzeit. Mainz : Zabern 1998, p. 73, n. 435. Dunstan, William E. Ancient Greece. Orlando, Florida: 2000, p. 363. Queyrel, Francois. Les portraits des Attalides: Fonction et représentation. BEFAR 308 (Athens: École francaise d'Athènes, 2003), p. 170, n. 227. Ogden, Daniel. Alexander the Great: Myth, Genesis and Sexuality (Exeter: University of Exeter Press, 2011), p. 157. Picon, Carlos, and Sean Hemmingway, eds. Pergamon and the Hellenistic Kingdoms of the Ancient World (New Haven and London: Yale University Press, 2016), pp. 111-112, no. 13b, ill., entry by Jens M. Daehner.